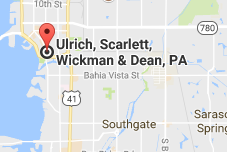 Practice Areas - Ulrich, Scarlett, Wickman & Dean, P.A. Our Appellate Practice Group is available to assist in matters that involve, or are likely to involve, an appeal. Our Appellate lawyers act as lead appellate counsel in matters that the firm handled in the trial courts, and also handles appeals of cases tried by other law firms, or acts as co-counsel with other lawyers for appellate purposes. Our business law practice includes assisting clients with all of their business needs, beginning with advice regarding the selection of the appropriate type of business entity, whether a general partnership, limited partnership, corporation, or limited liability company. Subsequent services include the preparation of organization documents and formation and registration of the entity with the appropriate governmental agencies, preparation of shareholder or partnership agreements, preparation of operating agreements, preparation of corporate minutes and resolutions, and preparation of documents necessary to effectuate stock buyouts and the purchase and sale of existing businesses. In addition, we provide general representation and advice on day-to-day operational matters and representation in contract disputes and other business litigation matters. Our firm represents a wide variety of clients in their litigation matters, both as plaintiffs and defendants, in Florida county and circuit courts, as well as in federal court in the United States District Court for the Middle District of Florida. The representation includes all phases of the litigation or arbitration, including presuit negotiation, filing initial pleadings, discovery, alternative dispute resolution and, if necessary, the trial. Every effort is made to provide the most efficient, cost-effective solution for the client. The commercial litigation practice is similar to the civil trial practice, with a focus on the unique issues that business and commercial litigation entails. This includes attempts to avoid litigation through consultation and review and drafting of contracts. This area of law includes providing advice and assistance to owners and associations in all aspects of condominium and homeowner association operation, including the preparation, interpretation, review and amendment of declarations of condominium, bylaws and rules and regulations, preparation of letters of opinion, attendance of regular or annual board of directors’ meetings and representation of owners and associations in actions seeking the enforcement of deed restrictions, declarations of condominium, and related association governing documents. Our firm provides a variety of services to contractors, subcontractors, suppliers and homeowners in connection with construction law matters, including the preparation, negotiation and review of construction agreements as well as the preparation and service of notices to owner, claims of lien, contractors final affidavits and other documents required by the Florida Construction Lien Law. Should litigation become necessary to enforce or defend the claim of a construction lienor, we prosecute and defend all aspects of lien foreclosure actions. Our attorneys counsel and prepare various estate planning documents, including wills, revocable trusts, durable powers of attorney, advanced health care directives, living wills and a variety of other specialized documents. The practice of Estate and Trust Administration includes assisting clients in carrying out their duties as personal representatives or trustees, including preparation of necessary documents in the administration of estates and trusts. Our firm represents executors, trustees and beneficiaries in all aspects of inheritance dispute matters. Litigation in federal court requires special skills and experience. Our federal court litigators are licensed to practice in The Middle District of Florida and have both the substantive knowledge and technical skill required for success in federal litigation. Our foreclosure practice is committed to assisting individuals or businesses who are parties to foreclosure proceedings. The firm’s attorneys are experienced in lender workout agreements, loan modifications, pre-foreclosure and post-foreclosure counseling and strategies. If you are facing foreclosure, our attorneys and staff can assist you in preparing your legal defenses, arranging for a homestead foreclosure conciliation conference, and assisting in settlement negotiations with your lender. Our firm represents both developers and individuals seeking or opposing zoning, rezoning, variances and special exception requests. We believe by representing both positions at different times we are uniquely prepared to better represent both categories of clients in these situations. The practice includes meeting with city and county employees regarding proposed land uses and variances, representing clients before Boards of County Commissions, City Commissions, Boards of Zoning Appeals and Boards of Adjustment as well as the preparation and filing of zoning appeals and petitions for writs of certiorari. Our attorneys have performed these services at the City Halls in Venice, Longboat Key, Bradenton and Sarasota and at the county level in both Sarasota and Manatee Counties. Our firm has significant experience in both commercial and residential landlord/tenant matters, including evictions. We prepare, review, and counsel on all aspects of commercial and residential lease agreements and handle all different types of evictions. We can help obtain or defend against judgments for possession and monetary judgments. We represent both landlords and tenants in all phases of negotiation, formation, and disputes involving lease agreements. The real estate litigation practice is similar to the civil trial practice, with a focus on the unique issues that arise from real estate disputes. Our attorneys have extensive experience with, amongst others, quiet title actions, tax deed quiet title actions, land sale contract disputes, and foreclosures and foreclosure defense. This area of law includes assisting clients with all aspects of commercial and residential sales, purchases and refinances, including contract negotiation, preparation and review, facilitating the closing of the transaction and acting as title insurance agent. This area also includes representing real estate developers in all phases of the development, including property acquisition, obtaining governmental approvals and completing sales of developed property. Our attorneys also have extensive experience reviewing, negotiating and preparing leases, lease options and lease purchase agreements for existing commercial and residential real estate.